Build back strength. Improve mobility. Exercise safely. 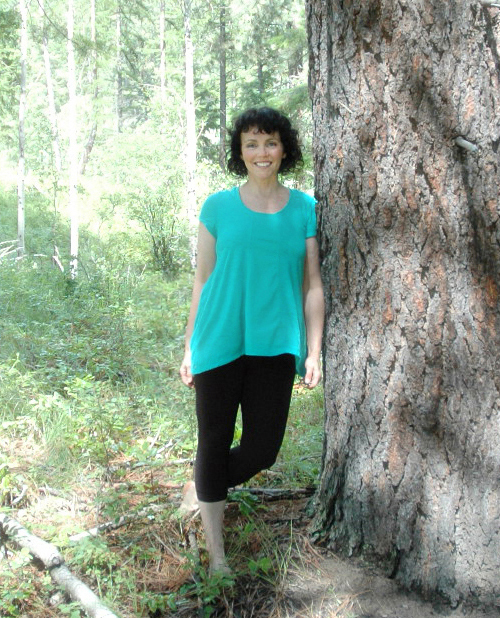 I’m Jennifer Houghton and in my 25+ years as a certified yoga and fitness instructor, I’ve worked with hundreds of clients who have lower back pain, middle back pain, and shoulder and neck pain. I want you to gain freedom from back pain without hurting yourself more. So I’ve created at-home practices that are safe, gentle, and include modifications for different levels. • Maybe midlife crept up and you are suffering from wear and tear. • Maybe you are tired of having a sore back and neck from standing at work all day. • Maybe you keep tweaking your back when you are taking care of loved ones. Every time you tweak your back you end up on the couch for weeks. Your back pain is making you tired, cranky, and stopping you from enjoying life. I can show you the intelligent movements and stretches that will keep you limber and strong for years to come. I have back and neck issues and was looking for a program that would compliment the treatments I was receiving. As a result of Jennifer’s workshop, I now realize how important breath control is to reducing pain and muscle tension. As the workshop progressed, I was more relaxed and was totally pain free for the rest of the day. I use many of the techniques Jennifer demonstrated daily and feel that my progress has been accelerated as a result of this posture workshop and this is allowing me to more fully participate in daily activities. 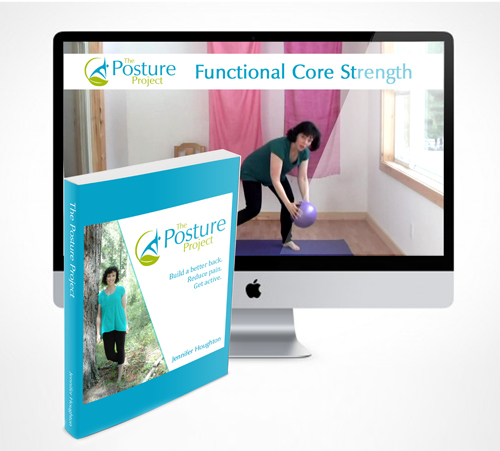 WHO IS THE POSTURE PROJECT FOR? 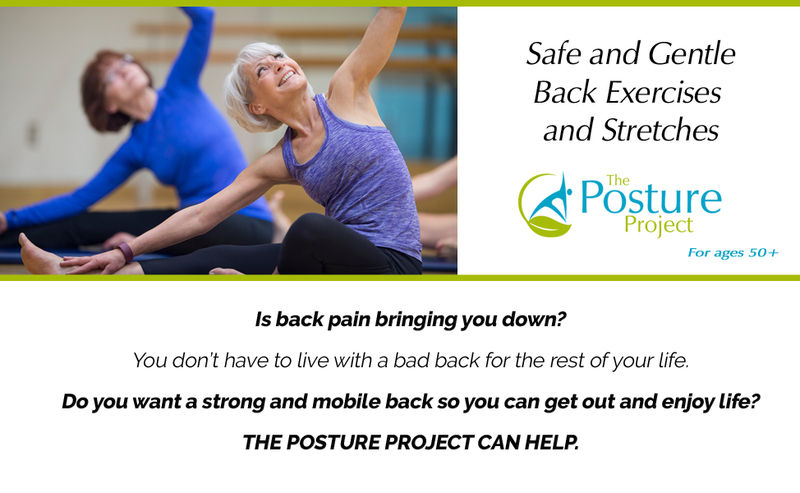 The Posture Project is for people over 50 (or younger) who want to stay active and maintain the health of their spine. It is for people who are currently able to walk and do most daily activities but are experiencing back pain while doing these things. You can build a healthy back WITHOUT having to do extreme exercises, lift heavy weights, do crazy-pretzel yoga poses, or perform hundreds of abdominal crunches. Effective back pain exercises should meet you where you are. If you are looking for gentle back pain exercises that let you progress at your own pace, you are in the right place. Its important to me that you only perform back pain exercises that are safe. That is why you have the option to include a 1-to-1 session with me to make sure you’re doing the exercises that are right for your body. I can show you how to pain-proof your movements. I have worked with people with all levels of ability from athletes, to midlifers, to seniors, people with MS, knee replacements, hip replacements, arthritis, metal rods, and spinal stenosis. See Who This Program is NOT for in the FAQ below or Contact Me with questions. The best way to overcome back problems and stay active in the years to come is to take care of your body now. You can do this with effective yoga stretches and back pain exercises that build strength and flexibility in a way that doesn’t cause damage. 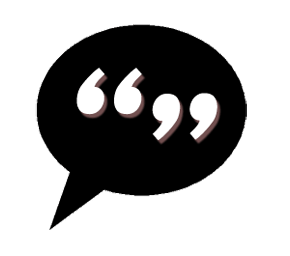 I’ll share all the best from yoga, breath work, Pilates, and functional strength training so you can counteract the wear and tear your back has suffered. Back pain exercises you can do on your own time in the comfort of your own home. Guidelines to get you started on the road to a strong back. Includes training schedules, how-to’s, and the science of a strong back. Learn how to align your spine. Find out how to maintain good posture throughout your day. Improve the flexibility and mobility of your back. 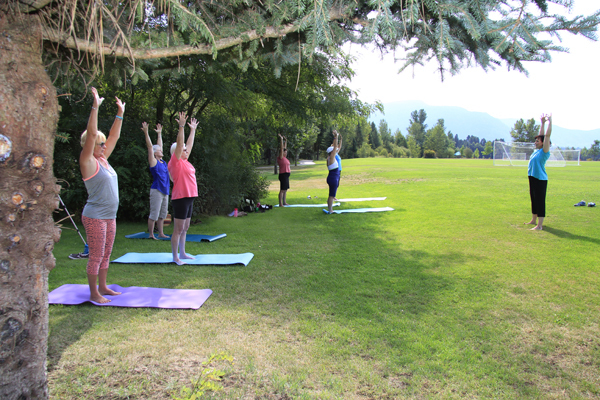 Gentle yoga at a beginner to moderate level that includes modifications for various physical needs. Master one of the essential components of building core strength and reducing back pain. Back pain exercises to improve strength, mobility, and flexibility from your neck to your hips. Little equipment is needed. Progress at your own pace. Click here to see an exercise sample. • The program manual (PDF). • An introductory video showing you how to safely align your spine. • (3) Beginner to moderate level yoga videos. • (2) Back pain exercises/core conditioning videos. • (4) Pain reduction breath work videos. • One-to-One Coaching Session with Jennifer via video chat. This is optional – see pricing below. All the videos are available to watch online from any device at any time. The manual includes timelines for how to incorporate the program into your schedule. • All the exercises and movements are low impact. • No yoga experience is required. • The exercises are designed to be safe for the knees, hips, and shoulders. You are welcome to contact me if you are unsure whether the program is right for you. Click here to fill out the contact form. Ask as many questions as you like! Are you ready to take action for a healthier back? Click the Purchase button to be redirected to the Paypal site for secure payment. When your payment clears you will receive an email within 24 hours with access to the content. Start getting a stronger back today! Coaching will provide you with expert help for pain proofing your movements. There alot of back pain exercises and programs out there. But they are missing the key ingredient that gets lasting results: breathing techniques to reduce pain and build essential core strength. 2) A unique type of breath work that focuses on the health of the diaphragm muscle. The diaphragm is a muscle in the center of the body. It not only plays a role in breathing but research shows it also provides stability for the spine. Studies have found that people with limited capacity in their diaphragms are more at risk for developing back pain. Most of the people I work with don’t even realize they are not breathing fully. That is why this program includes a 1-to-1 session with me to help you see where your breath and posture can be improved. The program also includes breath work training to get your diaphragm working to its full capacity. The level of the yoga in this program is advanced beginner. So most people will be able to do it. It will not be appropriate for people who have been completely sedentary for a long time – in such a case, I would recommend starting a program with a physiotherapist or rehab therapist first. As it involves standing movements plus exercises that are done lying down it is not suitable for people who are wheel-chair bound. It will be challenging for people who have knee replacements but it is still doable – there is some getting up and down off the floor but modifications are presented for many of the exercises and poses. It is not appropriate for people with extreme back pain or serious back conditions that severely limit spinal movement. It is not suitable for people who are still recovering from a serious back injury or surgery – you must have the go-ahead of your medical practitioner to exercise. 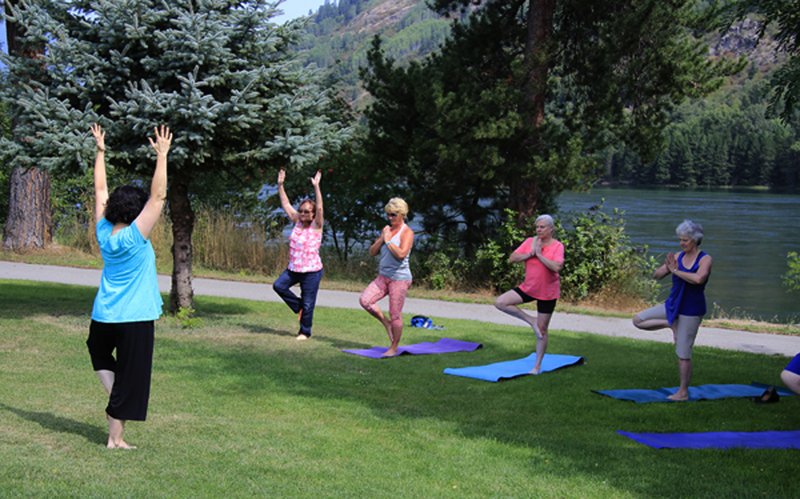 Please contact me prior to purchasing the program if you are unsure if it will suit your needs – jennifer (at) bountifulyogaandwellness (dot) com. I’ll be happy to discuss your needs. Will this eliminate all my pain? The breathing techniques in this program are aimed at aiding relaxation and de-sensitizing a hyperactive nervous system – in some cases when pain has been around for a long time, the nervous system can begin to misread normal signals as pain – the breath work can help the nervous system stand-down. This can help to reduce pain in many situations. If there is severe damage that has not been healed yet or an ongoing serious condition exists, it may not be all that is required for pain reduction. Will I be able to play my favorite sport again? That depends on where you are at, where you want to go, and how much training you are willing to do. By doing effective back pain exercises, you will gain more mobility and strength. Can I do this if I have fibromyalgia or arthritis? The gentle movements and breathing techniques in this program can help with fibromyalgia and arthritis. What is the level of the exercise? The level of intensity of the exercise sequences is moderate. A few of the practices may elevate your heart rate slightly. You are encouraged to practice at your own pace and a level that is appropriate for you. There is no pressure to ‘keep up’ or do anything extreme. You can do small segments of the program and gradually do more and more each time you practice. You can take your time to build up your strength and stamina. These back pain exercises are meant to make you feel better – not push you beyond your limits. I’ve been suffering with rotator cuff and psoas issues. Through Jennifer’s workshop I learned that I should keep the back of my neck elongated and my shoulders back while walking. I learned not to hold my breath and how to breath deeply while holding a pose. Mostly I’ve learned to listen to what my body is telling me. I always feel great after one of your classes. My body feels loose and flowy. Start building a stronger back today. Click the Purchase button to be redirected to the Paypal site for secure payment. When your payment clears you will receive an email with details within 24 hours. How much longer do you want to be stuck on the couch? Coaching is for you if you’d like expert help figuring out the safest and best techniques for your unique needs. © 2018 JENNIFER HOUGHTON. All Rights Reserved.